Bushwaffle are playful personal inflatables that transform the urban surface from hard to soft, impersonal to intimate, businesslike to social. By placing the power to generate urban forms in the hands of the individual user, Bushwaffle invite new forms of social interaction, collaboration, improvisation and play. 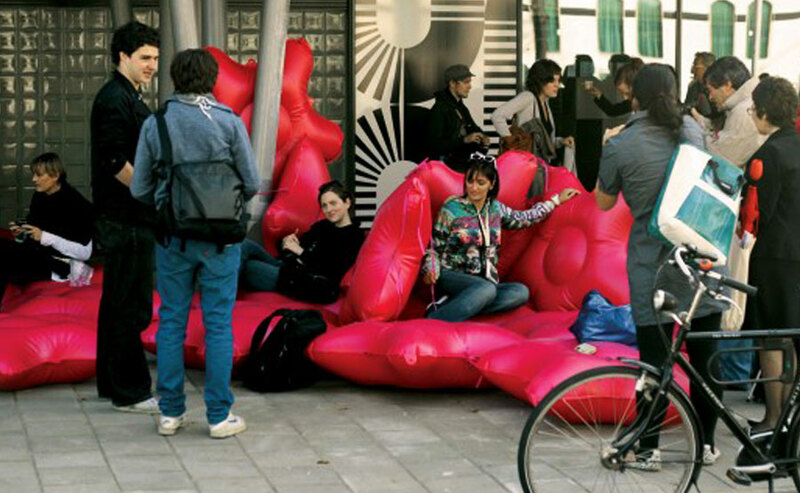 It is a modular inflatable street furniture that softens the hard, angular urban environment and provides opportunities for informal social interaction and collaborative architectural improvisation. Bushwaffle are also entirely kid-friendly, their bright color and playful shape encourage cooperation and play among friends and new acquaintances. While not approved as a flotation device, Bushwaffle float, slide, roll and bounce, and are easily moved by a large enough crowd, even when in formation.